KwaZulu Natal’s Elephant Coast stretches from the world heritage site of Lake St Lucia in the south to Kosi Bay, virtually on the Mozambique border. The Elephant Coast is an extraordinary, untamed area fast growing in popularity for its incredible variety of habitats and eco-systems that combine into an unforgettable blend of adventure, unspoilt scenery and unique experiences. Called the Elephant Coast after the country’s largest herd of indigenous African elephants that have lived in sand forests in this region for centuries, the Elephant Coast extends inland across to the Lubombo Mountains in the west, and includes the Hluhluwe-Imfolozi Reserve, the oldest game park in Africa – home to the big five. It is not hard to understand why the Elephant Coast is regarded as the ecotourism mecca of the Zulu Kingdom. Sand dunes blend with swamps, coastal forests, rocky shores, coral reefs, mangrove swamps, woodlands, savanna grassland, and the largest protected wetland in southern Africa, iSimangaliso Wetland Park (the Greater St Lucia Wetland Park). Getaways to this coastline are rich in adventure, and if you’re not game viewing, birding, paddling, snorkelling, hiking, on a horse trail, or diving then you’re surely out on a boat to see dolphins and humpback whales, or watching turtles lay eggs on the beach. Highlights of the Elephant Coast include Cape Vidal (wonderful beaches for deep-sea fishing and famous for whale watching); Sodwana Bay Nature Reserve (the mainstay of scuba diving); Kosi Bay (one of the most unspoilt regions with numerous lakes where you can watch local fishermen); and of course both the Hluhluwe-Imfolozi Game Reserve and the iSimangaliso Wetlands Park are highlights of the Elephant Coast, for obvious reasons. The village of Hluhluwe is in the heart of Zululand on South Africa’s east coast, home to the Zulu kings Dingiswayo and Shaka, who allegedly prompted the very first conservation laws and the oldest game reserve in the country – the Hluhluwe and Umfolozi Game Reserve, established in 1895. Only a two hour drive from Durban and four hours from Johannesburg the entire area around the Hluhluwe Reserve, right down to the Greater St Lucia Wetlands Park, now a World Heritage Site, has been given over to animal conservation and game farms and visiting the region provides one with an abundance of Big Five viewing, over 350 species of bird and a variety of other wildlifeincluding rhino, giraffe, wildebeest and many antelope species. 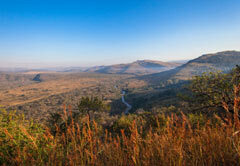 The main attraction of the area is without doubt the Hluhluwe Umfolozi Game Reserve. This low-risk malaria park is famous for rescuing the white rhino from the brink of extinction and its ongoing protection of both the white and black rhinoceros. The park covers about 96 000 ha and game aside, contains an incredible diversity of fauna and flora. The park provides a couple of self-guided auto trails over and above game viewing and guided walks are also available. The first Iron Age communities are reputed to have settled along the coast and in the lower-lying river valleys in Hluhluwe from 300 AD and there is evidence of metal working sites that date back to 1000 AD in the reserve itself. The Greater St Lucia Wetlands Park has five distinct eco-systems that range from sub-tropical seas, coral reefs, sandy beaches and lush forests to grassy plains, dry savannah and reed and papyrus wetlands. An aerial view of the Maputoland coastline gives one an indication of the amount of water and natural forest in the area. The inland lakes and estuaries are home to hippos, crocodile and fish and the beaches of St Lucia, Cape Vidal and Sodwana Bay are easily accessed from Hluhluwe, providing whale and dolphin spotting as well as scuba diving and other water activities. Ingwavuma is a small rural town, nestled deep in the countryside of the KwaZulu-Natal Province of South Africa. Part of the Umkhanyakude District Municipality, Ingwavuma enjoys the hot, humid conditions typical of this part of South Africa for some of the year. However, being situated in the mountains and 700 metres above sea level, the climate can be cooler and more extreme than along the balmy coastline. As one scales the Lebombo Mountains to find Ingwavuma, it becomes clear that these scenic vistas are unrivalled in terms of their natural beauty, verdant lushness and enormous scale. This little town was established in 1850, and was burnt to the ground during the Second Boer War in 1899. It was re-established the following year. Thanks to the rich Zulu culture and the fascinating history of British and Boer settlers, Ingwavuma continues to be full of heritage; inviting visitors from South Africa and all over the world to come and learn about the people and the place. Ingwavuma occupies only 1.74 square kilometres and is home to about 1 500 people. It has a number of schools, a hospital and a small shopping centre. The entire area is rural, however, and the facilities and services remain compromised by a lack of funds. Jozini, a small town in North Eastern KwaZulu Natal on the main route to Mozambique, is synonymous with the dam of the same name – the Jozini or Pongolapoort Dam. This huge dam, on the Pongola River, provides a rather dramatic doorway into Maputaland and the river supports a massive population of fish, hippos and crocodiles as well as the people who live in the area. The Jozini Dam lies in between the majestic Ubombo and Lebombo mountains on the Elephant Coast and covers over 16 000 ha. The dam was originally designed to irrigate over 80 000 ha of farm land supporting products such as sugarcane, rice, coffee and various sub-tropical fruits. Many have compared it to Lake Kariba in Zimbabwe and it is fast becoming the mecca of many wild game seekers as farmers convert vast tracts of land around the dam back to their virgin bush in the bid to realise a dream to return this area to its former wild life kingdom. Lake Jozini, as the dam is now called, has become very popular as a Tiger fishing destination and because the dam borders with the Pongola Nature Reserve and Game Reserve, you can view wildlife from your boat and glow-flies light up the early evening shoreline, transforming the water into an incandescent array of fairy lights. The main attraction in this area is the return of the elephant. But there are vast numbers of other game to be viewed, including: buffalo, wildebeest, giraffe, zebra, kudu, bushbuck, duiker, steenbok, hyena, cheetah, wild dog, cerval cat, warthog and even the occasional sighting of leopard, which roam the Lebombo mountains. The dam’s muddy plains and reed banks are home to a vast array of birdlife, over 350 different species, including the whistling duck, yellow billed storks, Egyptian geese, herons, kingfishers and several fish eagles. 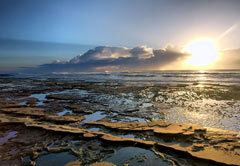 In the northern reaches of KwaZulu Natal, the final stretch of South African coastline is a wilderness wonderland that is still largely unexplored and unexploited. Kosi Bay is a rich network of lakes that stretches from Lake Zilonde, on the Mozambique border in the north, to Lake Amanzimnyama, in the south. Essentially it is a complex system of six large lakes, two smaller lakes and one of the best preserved estuaries on the Indian Ocean coastline. A number of lakes and streams enter the sea at Kosi Bay and the region is famous for its pristine beaches. Much of the area is protected within the Kosi Bay Nature Reserve. Kosi Bay’s lake system is part of the Greater St Lucia Wetland Park, a World Heritage Site, and is home to a large variety of birds, including a number of rare species; animals such as hippos and crocodiles and a great variety of fish and other aquatic fauna. This is the land of marshes, swamp forests – some of the largest in the country – mangroves (five species), coastal dune forests and palm communities. Add to this already impressive picture the annual sighting of Humpback whales, just off the beaches, on their northerly migration to Mozambique, and the visit of loggerhead and leatherback turtles to lay their eggs on the beaches every year and you can understand why Kosi Bay is such an attractive place to visit. Fishing is a way of life to many of the Thonga people of the region as a food source but is also very popular amongst visitors, although ‘tag and release’ is encouraged. Fishing is usually only allowed in the reserves and with a permit and fly fishing has become popular, although the presence of hippos and crocodiles does tend to add an element of danger to the sport. 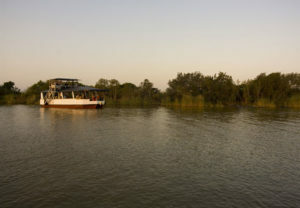 Kosi Bay is not only home to phenomenona such as the two-armed Mudskipper fish and the one-armed Fiddler crab, there are now a number of game reserves and private farms in the area that offer access to other species of the animal kingdom – rhino, giraffe, warthog, zebra, kudu and elephant are all within easy access. Deep sea fishing excursions are also popular. 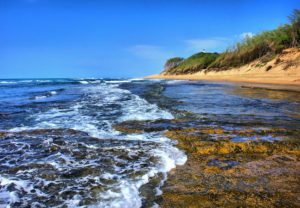 Set in the remote region of the Maputuland coast in KwaZulu Natal, Mabibi lies between Lake Sibaya and Sodwana Bay, forming part of the Kosi Bay coastal forest reserve. It’s one of Natal’s most spectacular coastlines. But what makes it even more enticing is that it is the only tropical dive site in the country and lies alongside Africa’s most southern coral reefs – you can understand why people don’t talk about it much. Who would want to broadcast some of the best diving in the world? The reefs off Mabibi are home to more than 1200 species of fish, and the warm waters attract schools of bottlenose dolphin, sharks, whale sharks and turtles. The turtles in particular are reason to visit Mabibi during February and March to see the hatchlings mad dash for the ocean, just moments after emerging from their eggs. The crystal clear water provides ideal conditions for most of the year, due to the subtropical weather in Mabibi and the warmth of the Indian Ocean. Snorkelling and scuba diving are without equal in the rest of the country on this bit of coastline. Possibly the most attractive aspect to staying in Mabibi is its seclusion. The sheltered beach lies bordered by beautiful rocky outcrops and dune forest sweeps away from the beach. 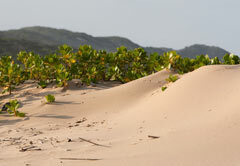 Add to this the element of sustainable tourism – Thonga Beach Lodge and the Mabibi campsite are part of the SappiWWF TreeRoutes Partnership, from which the local Mabibi community directly benefited during building and since, through a trust and employment – and the prospect of time out in Mabibi becomes more than enticing. In the rural heartlands of KwaZulu-Natal, bordered by Mozambique and Swaziland is the Umkhanyakude District Municipality. This district is home to Manguzi, which is also known as kwaNgwanase, and was formerly the town of Kosi Bay. This part of South Africa is known for its subtropical climate and the abundance of beautiful vistas. Manguzi is only about 15 kilometres from the border of Mozambique. The community here is rural, but the little town is equipped with schools and a hospital, which provide the locals with their basic needs. It occupies only 5.6 square kilometres and is home to about 5 600 people. Being close to the water means that this is an ideal spot for nature-lovers and watersports enthusiasts to visit. Swim, snorkel or explore the extensive beaches under the warm African sunshine. 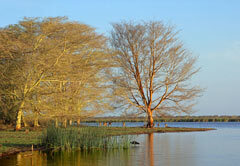 Manguzi is peaceful and unspoilt, giving visitors an authentic taste of South Africa’s beauty. It is also known for its relaxed atmosphere and the friendly locals, which give it added appeal. The small town of Mbazwana is a settlement that covers just over 10 square kilometres in the uMkhanyakude District. It falls under the uMhlabuyalingana Municipality in the South African province of KwaZulu-Natal. It is home to fewer than 5 000 people, of whom well over 90% speak Zulu as their first language. Mbazwana Mall is a new development that offers visitors and locals quick, easy access to supermarkets, corporate companies and other amenities and facilities, all under one roof. Mbazwana is situated close to the beautiful Sodwana Bay, which is renowned for its wealth of biodiversity – plant, land animals and marine animals. It is also the Mecca for those with a penchant for SCUBA diving, snorkelling, fishing and watching the many resident turtles, as well as other water sports. This is the idyllic spot for families and friends who want to make a day trip to the exquisite coastline of the eastern shores of South Africa. The little village of Mkuze lies in the shadow of the Ubombo Mountains just 18 km west from the entrance gate of the Mkhuze Game Reserve on the N2 north of Lake St Lucia. In this remote north eastern wilderness of Southern Africa, human presence is felt less and vast plantations of scrubland, freshwater pans and lakes form sanctuaries for rare plants, hippos, turtles and crocodiles. Summer temperatures soar and winters are mild and, although the Mkuze Game Reserve tends to be overshadowed by the Hluhluwe and Umfolozi reserves, this area is worth a visit for the amazing variety of bird and animal life and the incredible range of plant species – over 700 – as well as the different reptile and amphibian species sheltered in the park. Wildlife in Mkhuze Game Reserve includes the big Five including lion, leopard, buffalo, elephant and rhino to rare species such as wild dog, suni, leopard and hyena. Mkhuze Game Reserve now forms part of the iSimangaliso Wetland Park (previously known as Greater St Lucia Wetland Park) with over 360 km² of land. It was proclaimed a protected area in 1912 and is a birdlife mecca with around 450 identified species of bird in the area. Mkuze’s landscape is one of contrasts – primarily flat, dry sandy dunes, some of which are over 2 million years old. 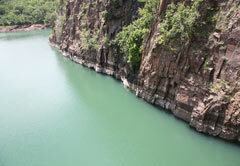 There are also water pans, a river gorge embedded with marine fossils and a thick acacia forest. 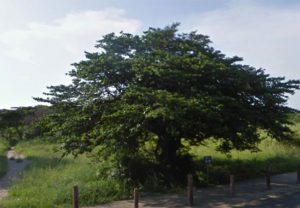 A rare giant fig tree forest lies on the banks of the Mkuze River, which curves along the northern and eastern borders of the reserve. There are five pans throughout the park. Three of these – the Kubube, Kamasinga and Kwamalibala – are set up with viewing hides to provide some of the best game viewing in South Africa, especially during the drier months when these waterholes attract large numbers of game. The Hhlonhlela and Nsumo pans further north in the park are home to communities of hippo, crocodile and white and pink backed pelicans. Just outside the reserve is the legendary Ghost Mountain. The mountain is steeped in legend, which claims that the site witnessed a number of fierce Zulu battles and is also said to be the place where bodies of the previous chiefs of the Ndwandwe clan have been laid to rest in secret caves along it’s base. Please note, this is a low malaria risk area but precautions should be taken when travelling to the region. Mtubatuba, which means ‘he who was pummelled out’, is a small town north of Richards Bay and close to the entrance of the Greater St Lucia Wetland Park. Initially established as a railway siding in 1903 in a swampland of reeds and papyrus, the town Mtubatuba was almost swept away in 1918 in one of the worst floods the area had seen in over 100 years. It was only in the late 1920s that efforts to drain the swamp began and Mtubatuba became an official village in 1950. 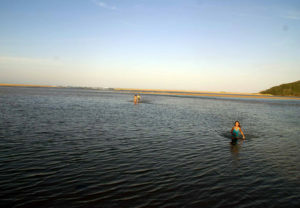 Responsible for much of the town’s battle with water, the Mfolozi River meanders across swampy plains before reaching the sea within metres of the St Lucia Estuary. However, it joins with the White and Black Mfolozi rivers on the boundary of the Umfolozi Game Reserve, potentially more than doubling its strength and explaining its capacity for flooding. The flip side of this same coin is the fertility of the Mfolozi Flats, giving rise to sugar farms and a mill. Mtubatuba has made its way onto the map of South Africa largely because of its proximity to Lake St Lucia and the Hluhluwe and Umfolozi Game Reserves. 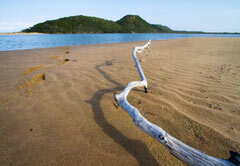 Mtubatuba provides a key stopover for tourists and travellers heading inland or to the coast. This is the land of sugar cane and forests and, further north, a mountainous ridge along the coast that culminates in a series of giant forested dunes. The highest of their kind in the world, they provide the backdrop to the medley of rivers, lakes, freshwater pans and swamp forest that is Lake St Lucia. 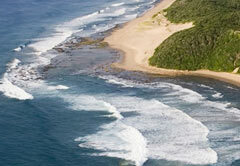 Right on the northern-most border of the South African province of KwaZulu Natal lies the little settlement of Ndumo. It is bordered by both Swaziland and Mozambique, enjoying the subtropical climate of this exquisite part of the country. 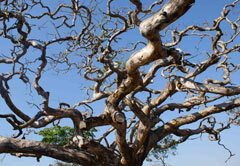 It is situated in Northern Moputoland, and its border with Mozambique is formed by the abundant Usuthu River. Although small, the town of Ndumo is situated only 400 kilometres from the capital city and tourist hub of the province, Durban (home to the King Shaka International Airport). It is approximately 650 kilometres from Pretoria in Gauteng, which is close to the OR Tambo International Airport. Being away from the glitz and glamour of the big cities, Ndumo enjoys a different kind of appeal. It is naturally diverse and plentiful, with a wide variety of plant and animal species for visitors from all over the country and world to enjoy. Some of the local bird species are so exciting that they attract visitors from afar. These include the southern-banded snake eagle, Pel’s fishing owl and broadbill, but there are countless others to spot. In addition, the Ndumo Game Reserve is a major attraction and is home to a number of animals, including plenty of antelope species, as well as hippopotamuses and crocodiles. This is one of those remote beach experiences that reminds one rather of a film set for a desert island, complete with perfectly warm waters, miles and miles of endless sandy beaches and forested sand dunes. A more consummate scenario one cannot even dream into reality. This is Rocktail Bay. Situated in the far off north eastern parts of the KwaZulu-Natal Elephant Coast, Rocktail Bay lies in the very far reaches of the iSimangaliso Wetland Park, just beyond Lake Sibaya. Not only is this the site of some of the most densely forested sand dunes but the chance to snorkel and spot turtles, large shoals of fish, dolphins and whales makes it a more than worthy destination, despite the distance you might have to travel. The beaches here are renowned throughout the world as a vital turtle nesting sanctuary. Endangered loggerhead and giant leatherback turtles lay their eggs in the dunes and, if you time it right (between October and March) you may be able to watch these beautiful beasts come to shore at night when the tide is low. It is an amazing sight to watch the leatherback turtle – on average between one and a half to two metres long and weighing in anywhere between 250 kg to 750 kg – make its way up the beach to a level above the high tide in order to dig a hole to lay up to 110 eggs at a time, and then make their way back again. If you miss the October to March egg laying time, then be there to watch them hatch from January to the end of March. This unspoilt coastline is, at any time of the year, a wonderful destination in the heart of lush vegetation, effortless beauty and a slowing of time. Sodwana Bay, meaning ‘little one on its own’ in Zulu, lies within the Greater St Lucia Wetlands Park, a World Heritage Site, and forms part of a continuous protected area stretching 150 km from the Mozambique border south to Cape Vidal and 3 nautical miles out to sea. Sodwana Bay is best known for its deep sea diving and beautiful coral reefs, regarded as the southern most coral reefs in the world and the only tropical dive site in South Africa. Only 4 hours drive from Durban and easily accessible from Johannesburg, Sodwana is considered the scuba diving mecca of South Africa. Divers can expect to see an abundance of tropical fish, moray eels, large schools of pelagic fish, hard and soft coral, sponges and, at certain times of the year, whales, whale sharks and dolphins. The water temperatures range from 24 degrees Celsius in summer and are seldom colder than 19 degrees making diving is a year round pastime. Visibility is rarely less than 15 metres and depths vary between 12 to 50 metre sites. The reefs themselves are thought to be over 4 000 years old and have plenty of caves, overhangs and pinnacles. It isn’t only diving that makes this beautiful area, covered with dense coastal forest, so special. Fishing, boating, bird watching and hiking – there is a 5 km self-guided trail for nature lovers – make this a destination for the whole family. Great snorkelling reefs are found in Sodwana Bay, Kingfisher Bay, Adlams, Algae Reef and Mabibi – all accessible by 4-wheel drive along the beach. 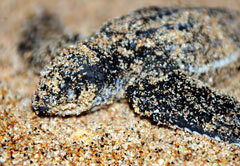 In summer, loggerhead and leatherback turtles come out of the sea on to the Sodwana Bay beaches to lay their eggs. Sodwana is also within easy driving distance of a number of game reserves, including the Hluhluwe Umfolozi Park. The little town of St Lucia lies at the southern most entrance to the iSimangaliso Wetland Park(formerly known as the St Lucia Estuary and Wetlands Park), a World Heritage site that stretches all the way from Kozi Bay in the north, to Cape St Lucia in the south on the Elephant Coast. Portions of this area have been a game reserve since as early as 1895, and it is no surprise to find this part of the world high on the ‘must visit’ list of any traveller worth his salt. The little town of St Lucia serves as something of a tourist hub for the park and has grown substantially from the sleepy little hollow, perched below a canopy of trees, to the feeder town that is geared for domestic eco tourism today. There are myriad accommodation options, restaurants, supermarkets and other tourist facilities within the town that make a stay here pretty effortless. As the doorway to a world of fresh water pans, lakes, mangrove and reed swamps, marshy grasslands, coastal dunes and an abundance of wild life, the town too lies in the heart of unspoilt beauty. Life here is rather laid back and peaceful, if the monkeys and little duikers that roam the streets freely are anything to go by, and it serves as an ideal stopover before heading on towards the more remote areas of the Elephant Coast. St Lucia’s popularity with anglers is self-evident – seafood restaurants are numerous, and bait and tackle shops are anything but thin on the ground. When one speaks of St Lucia, really one is referring to the Greater St Lucia Wetland Park, South Africa’s third largest park. On the north-eastern coast of KwaZulu Natal, this wilderness reserve covers some 280 km of coastline, stretching from Kozi Bay in the north to Cape St Lucia in the south and was the first park in South Africa to be declared a World Heritage Site by UNESCO in 1999. The park includes Lake St Lucia and its estuary, a surround of wildlife reserve, a number of islands and a section of the Marine Reserve along the coast. It is home to five recognisable ecosystems and includes swamps, lake systems, coral reefs, beaches, wetlands, woodlands and coastal forests. The Great St Lucia Wetland Park supports the country’s largest population of hippos and crocodiles. It is also home to leatherback turtles, black rhino, leopards, over 530 species of birds, including greater and lesser flamingos, and some 36 species of amphibians. The park supports more species of animal than the larger and more well-known Kruger National Park. The unique combination of subtropical coastline and African game park is what draws visitors as well as the sheer viewing pleasure – this is one of the most beautiful spots on earth. During November sea turtles come to the beaches to lay their eggs, whales frequent the waves from June through September, making their way southwards and the park is a very popular fishing destination, providing surf fishing, kite fishing, fly fishing, spear fishing and deep sea fishing. There are also a number of hiking trails through the park, some of them a few days worth of walking. There is no limit to activities in the area. There are hippo cruises, kayak safaris, game safaris and the beautiful beaches with their high sand dunes are perfect for walks, volley ball and sunbathing. 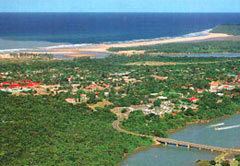 The town of St Lucia proper is at the most southern entrance to the park, about 300 km from Durban.